Gloucestershire-based Bond Air Services (Bond) is delighted to announce the start of a new air ambulance operation for North West Air Ambulance in the Merseyside area. 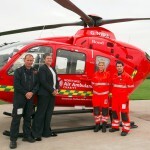 The new service will be provided by a Eurocopter EC135T2 aircraft, which has been modified for Helicopter Emergency Medical Service (HEMS) operations [Editor note – not specifically modified for this contract as the aircraft involved has been operated by Bond for Devon Air Ambulance for the last 10 years]. The aircraft joins the existing fleet of two aircraft covering the North West, which are based at Blackpool and Manchester. The North West Air Ambulance Charity plays an important role in the delivery of HEMS operations, and the additional aircraft represents a significant step forward for the Charity, extending the level of medical cover to the wider Merseyside area. Taking delivery of the aircraft, Lynda Brislin, Chief Executive Officer of North West Air Ambulance said: “I would like to thank everyone who has made donations to the North West Air Ambulance service, which ultimately has allowed us to add this helicopter to our fleet. We are delighted to see the new and extended service commence in partnership with Bond Air Services”. The North West Air Ambulance Charity has announced that it will be adding a third helicopter to its fleet, which will enhance the life-saving service being provided to patients across the region. The addition of the further aircraft will allow the charity to undertake more critical and intensive work at the scene of emergencies, allowing support of transfers between Intensive Care Units and providing a greater coverage to patients across entire region. Based at Barton airfield, the new aircraft will undertake a trial of the enhanced service from October 2013 and will initially be coloured red until the scheme is complete. Should the trial be successful, the helicopter will join its yellow fleet. Since it launched in 1999, the charity has flown more than 11,000 missions across the region. Committed to continuously enhancing its service and improving patient care, the charity moved its aircraft to bases at two of the region’s dedicated trauma hospitals in August 2013, allowing qualified doctors to travel onboard to incidents which require specialist clinical care on scene. “However, as a charity, developments of this nature come at a significant cost and would not be possible without the support and generosity of the North West public who are fundamental us remaining operational”. For more information on how to support the charity or to make a donation, please visit www.nwaa.net.